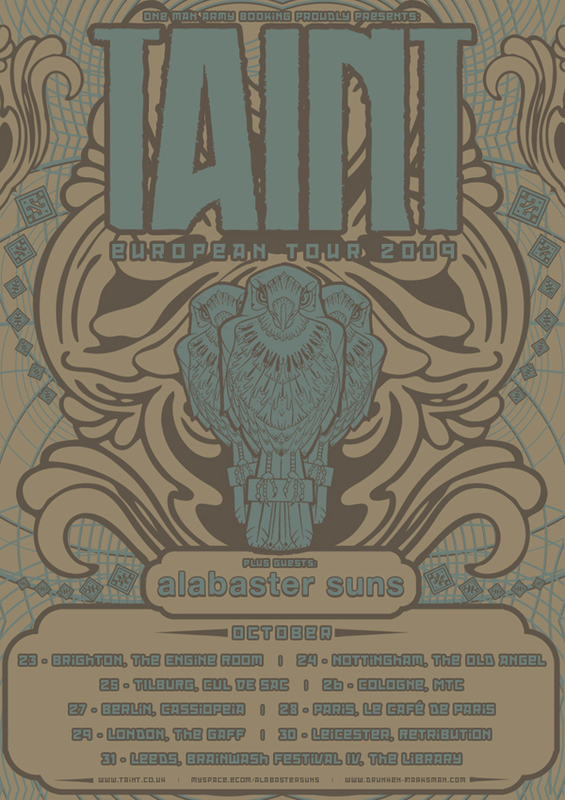 We're really glad to be heading out in the van again in October, and to be taking our friends Alabaster Suns with us. Look out for new shirt designs, and quite possibly a screened poster of the image below. Perfect Christmas gifts for the family! Sat. Sept. 26th - Rock Fellah Rock Festival, St Hilaire de Loulay, France. w/ Dalek, Year Of No Light & more..
Uk/Euro dates, now booking. More soon! April 17th, 013 Club, Tilburg, Holland. Taint w/ Down, Grand Magus, Capricorns, Diagonal, Serpent Cult, The Devils Blood and Litmus. We hope to finalize the Feb. 14th show ASAP, so will let you know more as and when. Feb/Mar/Apr '08 tour info coming very soon. w/ Korn, Cradle of Filth, Alice In Chains, Opeth, Entombed, Knut, Knuckledust, + more..
w/ Opeth, Bolt Thrower, Burst, Blindside, Cult Of Luna & more..